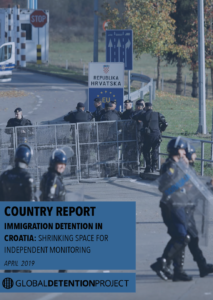 Immigration Detention in Croatia (2019 Report): Traditionally a transit country for people attempting to reach Western Europe, Croatia took on new importance for refugees and migrants in late 2015 when the main migrant route shifted through the country. Since then, the government has grown increasingly security-focused, albeit while maintaining a humanitarian narrative. Non-citizens may be detained even before they receive a return decision and are required to pay for their detention. The country’s treatment of child migrants and asylum seekers has also been the focus of criticism, particularly its policy of placing unaccompanied children in institutions that are inadequately equipped to care for them and its practice of placing unaccompanied children with unrelated adults. View the Croatia Immigration Detention Profile Page. Croatia has long served as a transit country for non-citizens attempting to reach Western Europe. However, the country took on new importance for refugees and migrants in late 2015 following Hungary’s construction of a fence along its border with Serbia, which had the effect of shifting the main transit route through Croatia. By the end of 2015, more than 550,000 people had traversed Croatia, of whom only 24 applied for asylum in the country. Faced with a surge in new arrivals, the government responded with a mix of new security policies and ramped up humanitarian assistance, including escorting refugees from the Serbian border to transit reception camps as part of their onward journeys. Besides widely publicised restrictive measures, there are a number of practices that the country has attempted to keep out of the spotlight. According to many reports (some of which include medical documentation), Croatia systematically carries out pushbacks into Serbia and Bosnia and Herzegovina—in which force is frequently applied. The Croatian Ombudsman found that such practices could violate Article 3 of the European Convention on Human Rights, which prohibits torture and ill-treatment. According to a 2019 Amnesty International report, given that EU funds have been granted to Croatia for the purpose of border security, the EU is complicit in these systematic and violent pushbacks. As the allegations of violent pushbacks on the borders have multiplied, authorities have tried to discourage public scrutiny of the country’s migration practices and attempted to undermine the credibility of such reports. The Croatian Ombudsperson, for example, has been denied access to migrant-related information and civil society groups helping refugees have been accused by the Interior Ministry of “facilitating illegal migration.” Their volunteers have been harassed, confined for hours by police without any charges, and threatened with criminal prosecution for speaking out about police violence. Hate speech against migrants—often fuelled by the media—has become widespread and the offices of organisations helping refugees have been vandalised. Since early 2017, the number of rejections of asylum applications submitted by Syrians and Iraqis has soared, based on a “security obstacle” identified by the Security and Intelligence Agency. It appears that the use of a “security obstacle” relies on a broad interpretation of the legal provisions and is not subject to independent supervision. Croatia refuses entry to large numbers of people—around 9,000-10,000 annually. It apprehends approximately 3,000 people without proper documentation (figures that are similar to those in Norway and Romania) and orders around 4,000 to leave its territory—approximately half of whom are forcibly expelled. In 2016, the number of people applying for asylum increased tenfold, presumably due to strict border controls in destination countries. However, numbers subsequently began to decrease, particularly after the EU-Turkey deal was reached in March 2016. In 2015, 210 applied for asylum; in 2016, 2,225; in 2017, 975; and in 2018, 800. While the number of applications has not returned to pre-2016 levels, they are still relatively low, and in 2018 the figures were comparable to Iceland, which registered 775 asylum applications that year. In 2018, 928 non-citizens were detained in Croatia. Croatia joined the European Union in 2013 and has transposed relevant EU migration- and asylum-related legislation. As part of the process of joining the EU, Croatia received funding from Brussels for a number of immigration-related projects. The EU provided eight million EUR for the construction of a specific unit for vulnerable persons within the existing detention centre in Ježevo as well as two border detention facilities, which were opened between 2016 and 2017. The EU also provided 120 million EUR for the construction and modernisation of 40 border crossing points and the purchase of border control equipment.